Who would know that an unknown album from an unknown artist in 1970 (Rodriguez) would become a huge phenomenon in South Africa? Rodriguez himself was never aware of his huge success, as well as most other Americans. His music was lost in the US but, by a strange coincidence becomes a cult hit in South Africa and becomes a symbol of rebellion for the underground white, anti-apartheid sub-culture. 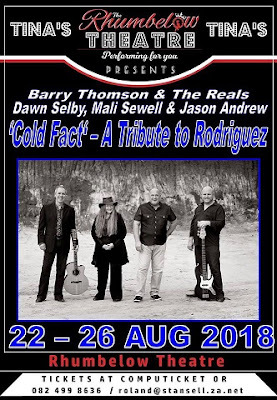 Barry Thomson and The Reals are back by popular demand at Tina’s Hotel in Kloof with “Cold Fact” - A Tribute To Rodriguez. The show features all his well-remembered songs such as I Wonder, Establishment Blues and Sugar Man, amongst others. This musical tribute to Rodriguez’s music is performed by Barry Thomson and ’The Reals’ with Musical Director Dawn Selby on keyboards and percussion, Mali Sewell on drums and vocals, and Jason Andrew on bass guitar and vocals.